Obviously I am in the sun out, legs out mode. There aren’t that many opportunities to catch the rays in London, so…. Not just that, this post is written mid-sunbathing in Victoria Park, wearing a bikini. Deal with it. Back to legs. I’ve already talked about getting my pins ready for the summer and this works added oomph to it by giving me all I need for amazingly good looking legs. Starting with the multi-award winning skin deep dry leg oil. I cracked open a few this blend of 19 essential oils, including lifting and toning rose, circulation-stimulating tuberose oil, healing and soothing sandalwood and evening primrose a few weeks ago. Brilliant to blitz the dry skin on the legs it retains and restores hydration. It is also fabulous for elbows and now comes in a handy 80ml size, making it holiday ready. I have to say I really enjoy massaging it on my legs after the shower and because it smells great, it’s a true treat for the senses. Now, anything that says shimmering is already in my good books. Add 24 carat gold and vitamin rich add and I just wanna put it all over my body. And face. But let’s calm down. The skin deep golden elixir is a fabulous serum containing vitamin A, revitalising Clary sage, antioxidants rose and patchouli plus soothing aloe vera and camomile. It has a very subtle shimmer from real gold, which reflects light and makes skin look smooth, bright and young. Love does not quite cover it. Now, talking about shimmer, the perfect legs sculpt and shine is just the right thing for those day s legs are out out. We all know the secret to legs out in photo shoots: contour and highlight, which is not something we will do just to pop to the supermarket, but a bit of shimmer alone goes a long way. Its golden shimmer highlight comes from a mix of caramel and light diffusing mineral powders that catches the light and brings out the best bits on your pins, shaping and defining. I am a huge fan already. Perfect for my rather naked-y festival attires coming up! And it is not just pretty, it also cares for the skin with hyaluronic acid and algae extract. Finally, to round up the leg love, the perfect legs skin protector with an SPF 30, which comes as a handy spray and it is tinted using tinted caramel and mica, suitable to most skin shades as it is subtle and blends very well. It delivers UVA and UVB protection and also superb care with hyaluronic acid, shea butter, vitamins E and C.
For me, it works like a primer, not too much delivering colour but working on texture and slightly softening imperfections. They can be used in combination, but if I have to pick one to invest on first, it’d be the classic skin deep dry leg oil. I mean, I love oils, to start with. And after some time using it daily, you don’t even need to use anything else. It moisturises, nourishes and skin gets better at retaining the moisture and the dry patches become a thing of the past. The this works skin deep range, including the dry leg oil (£39.50, 120ml and £25 for the new 80ml travel size) and the golden elixir (£45, 120ml) , as well as the perfect legs skin protector (£40, 100ml) and the sculpt and shine (£28, 60ml) are all available (together with all the other amazing this works products, legs or not) at the this works website. Oil on my face. That is something I never thought I’d put on deliberately. Having had problematic, blemish skin all my life, I always struggled with the oiliness of my dry skin. Three years ago, facial oils changed my life. And my skin. For the first time, I felt radiance coming from my acne-treatment-battered skin. And oh, boy, did I get addicted! And now, I cannot live my life without it. For those that like me ran away from facial oils, give it a go. The reasoning behind it is that if you provide oils to the skin, it won’t produce, or produce much less of it. On top of it, oils carry a great concentration of raw nutrients, nourishing the skin and working mainly on texture and condition. Some nights, all I put on is face oil. I give it a lovely uplifting circular massage to my face and neck, breathe in the natural aromas and off to bed I go! The this works stress check face oil is a bliss, I’ve been loving it recently. On top of its redness relief, calming and hydrating properties, thanks to its botanical oils, vitamin C, E and omega 3, it has the most calming neroli, patchouli, lavender, vetivert and camomile fragrance. A treat for face and mind. Caudalie has just launched a fab facial oil, the Vine[Active] Overnight Detox Oil, perfect for city skins which are exposed to pollution and free radicals. It is 100% natural and works towards detoxifying and regenerating stressed skin. Full review coming soon! And while on the natural subject, other pure blend oils such as Dr Jackson’s everyday oil and the Skin & Tonic London Naked Beauty oil, a bit richer, are perfect for overnight. I feel they work their magic getting deep in the skin, healing and supporting the skin regenerating process. I love that Dr Jackson’s everyday oil also comes in a handy roll on, perfect for travelling, and perfect to carry on the plane. Definitely one to invest on for the holiday season, for its portability and to help sun exposed skin heal! Super light oils like the Body Shop Oils of Life facial oil, the Eucerin Facial oil and the dermalogica phyto replenish oil are perfect to add to the foundation for extra hydration and glow. For more specific needs, the GOSH Primer Oil Essence doubles up as a night oil that preps the skin for the next day and the Indemne Gimme Clear! oil is a helping hand for blemish prone skins. Of course, I cannot leave out the first oil I ever put on my face: balance me radiance face oil. On the “natural, richer” category, this one really changed my skin and I owe it my absolute love (ok, obsession) with facial oils. The market is brimming with great products, for all budgets. It is a great time for facial oils. And my skin is grateful! What about you? Have you tried facial oils? How do they feel on your skin? Or are you like me in the beginning, scared of using them? Now, that is a big claim: plumper and more radiant skin. can one line of products deliver? Well, sceptic as I am, I must say the this works light time range does not disappoint. I first came across the light time skin plumper, a light moisturiser that seems to wake up and un-crease the skin. I reviewed a long time ago and since I could not let go. It is perfect for the morning, to smooth that pillow face and fight fatigue. However, I was totally impressed with the other products on the range, starting with the amazing light time open eyes eye cream. Apart from the product itself, the best thing about it is that the hole from which the product is dispensed is not directly on the fabulous massaging metal applicator. It makes a massive difference applying them smoothing separately; for me, it is just more practical. The de-puffing cream is light, glides and absorbs very well. It contains vitamin-rich algae, Persian silk tree extract, aloe vera and Argan 0il to smooth, revitalise, soothe the delicate round the eye area. The biggest surprise comes at the end of this piece: the light time cleanse & glow. Most of you will know I don’t like cream cleansers. I am a foamy cleanser girl through and through. However, this got me from day one. Applied on dry skin and massaged, this balm starts melting makeup straight away. Then, add a bit of water and keep massaging in circular moves to activate the vitamin C and cleanse even deeper. Remove with water and skin is super clean and comfortable. Nourishing and a delight to use, it removes even eye makeup rather well (minimal left for the eye makeup remover, I tell you!) and contains jojoba, water-activated vitamin C and vitamin E.
The whole range is tightening, smoothing and brightening; weirdly, skin feels awake after use, so it’s my favourite for the morning routine. You can get them from the this works website. The cleanse & glow costs £30 (75ml), open eyes, £25(15ml) and skin plumper, £29 (30ml). I have that kind of skin that goes downhill during the day – it loses hydration, lines and scars become more visible, even if make up does not sink. Add the weather and the stresses this time of the year and boom! Skin nightmare! Night time is very important for skin; it’s the time it restores, heals and resets itself. And because This Works develops its products based on our circadian rhythm, it caters for all skin needs at different times of the day. In my search of replenishment, I have fallen in love with their No Wrinkles range, which supports my skin natural restoring abilities. The amazing Wonder Essence (£30) is a water like product that works to brighten and rejuvenate skin. I apply after cleansing and its natural protease enzymes gently exfoliate while antioxidants protect and hyaluronic acid hydrates the skin. It’s a great start to the night routine. Then I move on to the eyes with Tired Eyes (£42), a tightening serum that fights puffiness, tiredness and lines. Containing detoxing Persian silk tree extract and counting with the retinyl palmitate, hyaluronic acid, botanical oils and plant extracts super blend, present throughout the range, this eye cream combats both the signs of ageing and tiredness. After that I apply the Night Repair (£45) serum, which has a thicker than expected texture for a serum, but absorbs super quickly. It works by reducing the signs of tiredness and it attacks glycotoxins, which are produced when we don’t get enough sleep. It contains Persian silk tree and cactus flower extracts, as well as retinol to prepare the skin for its natural night repair rituals. Then comes the Midnight Moisture (£46), a super nourishing moisturiser (which some days I feels is on the richer side for my skin, so I replace with another or an oil) that works hard to accelerate and support the overnight repair and detox of the skin. Persian silk tree extract works on the detoxification, retinol on collagen production and cell renewal, hyaluronic acid on hydrating and plumping, with evening primrose and jojoba oils and shea butter adding extra moisture richness. Add a little (ok, maybe not just a little) of their Sleep Plus Pillow Spray and voilá: a great night sleep awaits! And a beautiful radiant morning ensues! You can get the whole No Wrinkles range on the This Works website. And I hear they are having a sale preview – 25% off on some of their hero products! Hurry – it ends at midnight 23rd December! This works is a brand I like more every time I use a product or discover a new one. They don’t seem to do much wrong in my eyes. The light time skin plumper is one of those things we all need in the morning. I am definitely not a morning person,so welcome anything to make me feel or look alive. It’s a face moisturiser with a very fluid consistency and a lovely “wake-me-up” smell. The secret? Hyaluronic Filling Spheres that help smoothen up the skin appearance. Although the effect is quite subtle, I do feel some plumpness in my skin after application. It’s absorbed quickly, skin feels good and the cream behaves very well under makeup. Antioxidant vitamin C and Persian silk tree extract help the hyaluronic acid work in moisturising, plumping and smoothing the skin. Overall, a good morning product. It is recommended for day and night use, but I think this is more a day cream than night, to be honest, especially in the winter. The this works light time skin plumper cost £29 for 30ml and is available online and from selected retailers. Oil has been my beauty obsession for the past couple of years, so obviously I am always open to new products on my routine. 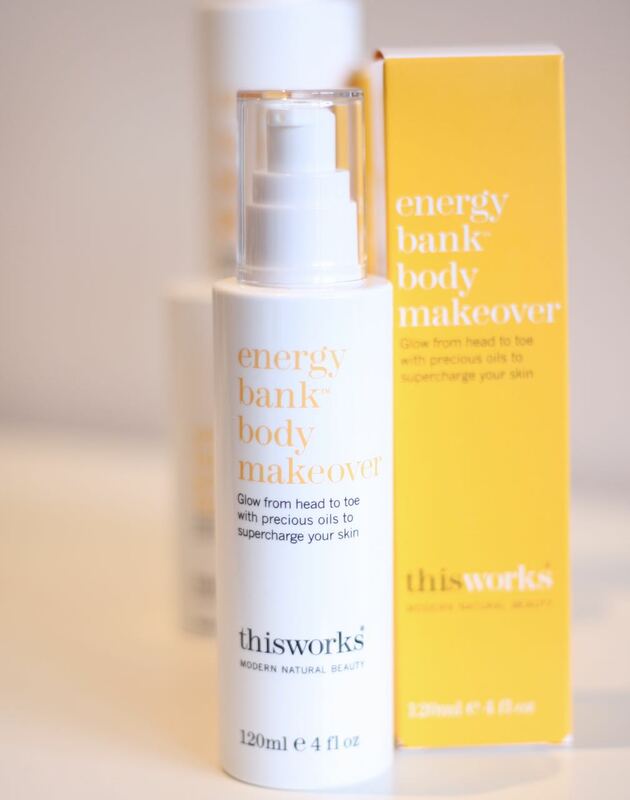 The this works body makeover is a glowing, super charging body oil, blended from 16 essential oils. If oil is what you want, oil you shall receive!